You might have guessed from the number of rib posts I have that I love ribs. I had a friend coming up from Montana and if you are going to serve an American friend ribs, they better be classic. So, I made a rib classic, St Louis Ribs. I am now in trouble with people in Memphis and Kansas City as they also are known for great ribs. Sorry guys. I love your ribs too! There is also jeopardy from people who don’t think my version of St Louis Ribs is authentic. This is caused by the fact that there are many great pit masters in St Louis and they all put their own spin on it. This is just my version. In my opinion, one of the main identifying factors for St Louis ribs is the way they are trimmed. They are usually made from a whole rack of side ribs, also known as spare ribs. I got a full rack on a recent trip to the US (they are hard to find here). I started by feeling down one of the ribs until you get to a cartilage knuckle. I used a heavy knife to trim the ribs above the knuckle away from the rib bones. I cut the flap off the end of the last rib on the small end. I flipped the ribs over and there is often a large piece of fat and meat on the underside. I trimmed this off. Then I pulled the sliver-skin off by lifting a corner of the ribs with a sharp knife and grasping it with a paper towel. I pulled the silver-skin off. I didn’t throw the trimmed pieces of ribs out. I cut them into 1 inch squares and made Char Siu Rib Tips for an appetizer. As the rib tips have to marinade overnight, I covered the ribs and refrigerated them overnight. If you are doing something else with the rib trimming, you can skip this step. I gave the ribs a rub with my Basic Barbecue Rub. You can use any rub you like. I put them in the fridge, uncovered for 2 hours. I preheated my Louisiana Grills smoker to 225 F and put the ribs on. I cooked them to an internal temperature of 185 F measured in the thickest part, not touching a bone. I can not tell you how long this will take because the thickness of ribs vary greatly. Mine took just under 4 hours. I brushed both sides of the ribs with Sweet Baby Rays Barbecue Sauce. Don’t hate me. I was busy and didn’t have time to make my own. I smoked for 20 minutes. I brushed both sides again and brushed both sides with sauce again. I smoked for a final 20 minutes. 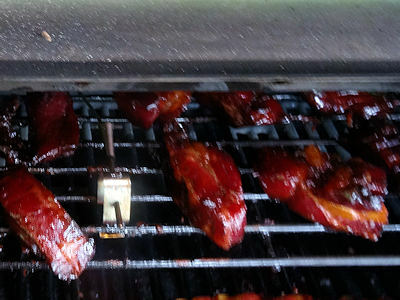 While they were finishing, I brought the Char Siu Rib Tips in for appetizers. I brought the ribs in and cut them to single rib servings. These are what I think of when I think of barbecued ribs. 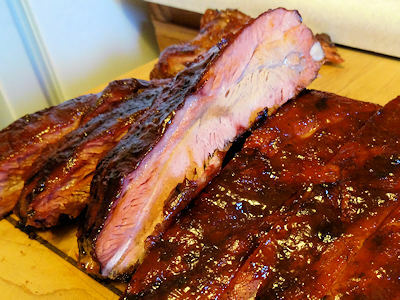 A basic rub on well trimmed ribs, smoked low and slow and glazed with a sweet/spicy sauce. Sigh, heavenly. Sounds like a perfect dinner! I have made a lot of my own bbq sauces over the years, but I just love Sweet Baby Ray’s. I mean, just the name, alone, lol! Well why didn’t you let me know sooner! Thanks for the kind words. Of course! Look for it in the mail! You can trust me.